BuzzFeed is still reeling from the special counsel's sharp rebuke of its report last week about a Trump Tower project in Moscow. In their exclusive, Anthony Cormier and Jason Leopold wrote that President Trump directed his former lawyer Michael Cohen to lie to FBI investigators about the timeline of the construction. Cormier admitted that he hadn't seen the documents he cited in the piece. In the same interview, however, he said he was 100 percent certain of his report. "I am rock solid," Cormier told CNN. "My sourcing on this goes beyond the two that are on the record. This 100 percent happened." The writers are still defending their story, insisting that they are sitting on proof as to not jeopardize their sources. Cormer doubled down that his sources are "not wrong." 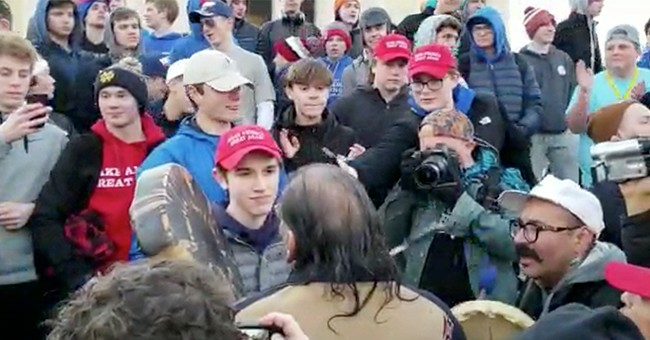 As if one controversy for the week wasn't enough for BuzzFeed, a senior culture writer for the outlet waded into the debate over a Covington Catholic high school student who found himself in the middle of a confrontation with a Native American veteran in the nation's capital over the weekend. The initial outrage was targeted at the student, Nick Sandmann. But, when more footage was released, it appeared that he did nothing wrong. The media narrative had already been written, however. Cue an online lecture from Anne Helen Petersen about white privilege. On her Twitter page, she compared Sandmann to Supreme Court Justice Brett Kavanaugh and "white patriarchy." You'll remember that Kavanaugh was accused of sexual assault during his confirmation hearings. Petersen, who in addition for writing for BuzzFeed once served as a visiting assistant professor, then launches into a long diatribe about how she knew boys like him during her tenure as an educator. "He was white, he was male, and — at least as far as he performed it — he was straight," Petersen explained. Sandmann was emblematic of this kind of white privilege, she continued. "And I don't think that being white or a man means you behave in a certain way," she writes. "But it does allow you to behave in a certain way, if you chose, generally without consequences. In public, in the classroom, throughout your life. That's privilege." After Petersen's final tweet on the matter, it was then that people started to notice a trend. Reports reveal that some of the students involved in the incident have been receiving death threats following the media frenzy.